GILBERT ZARAGOZA won his first professional fight in 2003 by TKO, and in 2004 Gilbert was selected to compete on Oscar De La Hoya’s reality show, ‘The Next Great Champ.’ Gilbert has been trained by Boxing Hall of Famer, Lou Duva, as well as Will Edgington, Don Conley and Timmy Brooks, to which he mimics their professional training styles to his own. Gilbert’s desire is to help everyone reach their goals, two boxing gloves at a time. PAULIE BOSSIO has been with the gym since it opened in 2011. Having competed on the Air Force Intramural Boxing team, he brings over 20 years of competitive and coaching experience. His martial arts skillset broadens out to having studied Wing Chun, Jeet Kune Do and Modern Army Combatives. 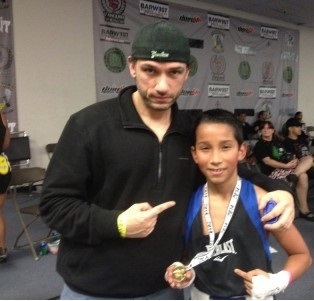 He is now a certified USA amateur boxing coach and is an ACE certified personal trainer. He pours his knowledge into the members at the gym and pushes them to their limits for them to not only succeed in the ring, but in life. Whether you are a beginner, an amateur, a professional, or someone who has never competed in a sporting event, our highly skilled trainers will be here for you to meet your needs. We are committed to providing a training program that cannot be matched. Mia is our new POWER VINYASA YOGA instructor. She will be teaching this powerful, energetic form of yoga where students will fluidly move from one pose to the next while connecting their breathing to their movements. She will also incorporate WARRIOR SCULPT with weights. It is designed to help get you deeper into yoga poses. Warrior sculpt combines yoga and light weight-training to tone the full body and will get your heart rate up.